This might be a little controversial, but we’re going to say it: basketball is a sport that all kids should be playing. Not that we're discounting any of the other awesome ball sports out there; any activity provides valuable exercise and keeps us healthy! But today, we want to talk about why basketball is so amazing, and why it’s a great sport for your child to add to their repertoire – in addition to any of the others that they might already be playing. For starters, you basketball is a sport for anyone. In terms of how accessible it is and how easy it is to play, boys and girls can team up together no matter their age, experience, strength, and skill! A sport that's easy to add to your backyard, no matter the size. 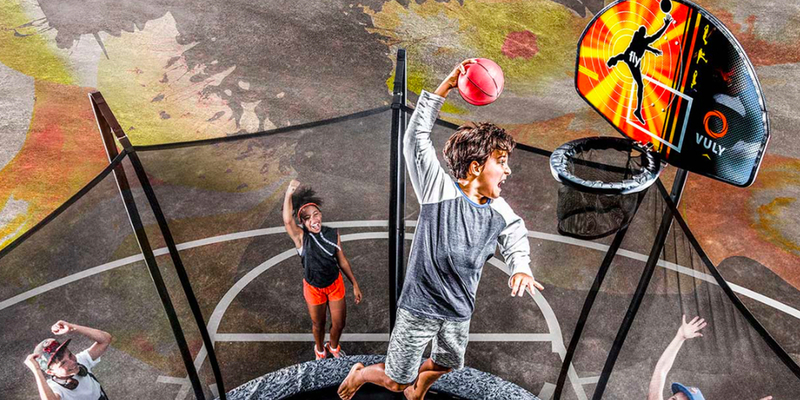 Even if your family is in just a small courtyard in a townhouse, you can still shoot hoops one-on-one . Great for developing confidence and teamwork, as well as leadership skills when playing in a team. A safe sport to play, with no tackles. While there is – of course – the risk of injury no matter what sport you're playing, basketball is strictly no-contact. Even the little ones can try their hand at it. Simple to pick up, but still has lots of opportunities to grow skills and improve. A great way to get an all-over body workout. Open to kids who want to represent their local area, state or even country. 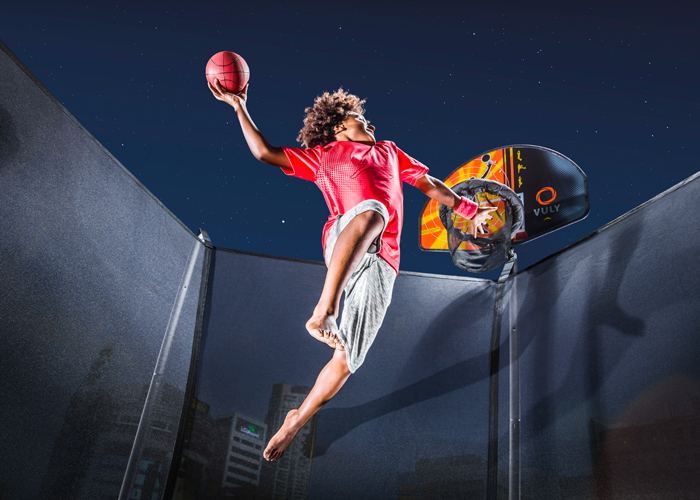 Even playable on your trampoline, with a Basketball Set accessory! What do we mean by the 'right sport'? When we’re saying that basketball is the best sport for your kids to play, we’re talking about how it compares to similar, team-based ball sports. Basketball first started out in 1891 and was played using peach baskets for the hoops. It didn’t even have today’s rules for dribbling the ball! Over time, basketball has evolved into the sport it is today, with a range of skills needed and honed in playing; abilities like speed, agility, strength, hand-eye coordination and overall fitness. It's safe to say when you compare a sport like basketball to something like volleyball or football that it really does stack up. We want to take a look at some of the benefits of basketball and look at why it's ideal for your kids. Now let's get into the nitty-gritty of what makes basketball a great sport to play. When you step out onto the basketball court (or even into a Vuly with a Basketball Set accessory) you have certain basic rules to which you have to adhere, but beyond that, there's a great deal of flexibility that you have as a player in terms of how you want to run, shoot, dribble and defend. While this is true of all sports that you can play at home, the creativity that you apply to your basketball skills can be the difference between a good game and a great game. In many other sports, like cricket, the amount of creativity you get will come down to how you choose to swing the bat or how you bowl. Playing basketball is a physically demanding game where kids are required to dodge, pivot, pass, catch, run, stop suddenly, defend, shoot, and abide by subtle rules. For many kids who have a lot of energy, basketball is a great way to harness some of that extra enthusiasm and put it to creative use – both physically and mentally. You don’t have to be the biggest or the fastest kid on the court, either. Of course, a bit of height helps, but for many kids they can achieve success on the court just from sheer skill. Want to play a game of cricket? You’ll need a bat, a ball, stumps and preferably a cricket pitch. Oh, and a few people to field. If you want to play basketball, you’ll simply need a spare hoop and one more person. If you're playing solo, you can step out on the court for a quick practise to up your abilities. If the weather is bad or if it’s night-time, you can still play no matter what. Only have a couple of people? You can still enjoy a lively game of one on one. Or if there are a few of you, you can play two on two, three on three – up to whatever number of people you have available. Pick-up basketball is very common in neighbourhoods with a basketball hoop, where players can simply come along and play. Some sports demand a particular physique, but with basketball, it’s enough to have some basic hand-eye coordination and you’re on your way. Sure, when kids get older, height does factor into the level of success that you can have as a basketballer, but when kids are younger, it's a great level playing field. In addition to these benefits, basketball provides ample opportunity for your child to go onto play representative sports at the local and state level. If you’re thinking of the perfect sport for your child’s next season at school, why not give basketball a go? 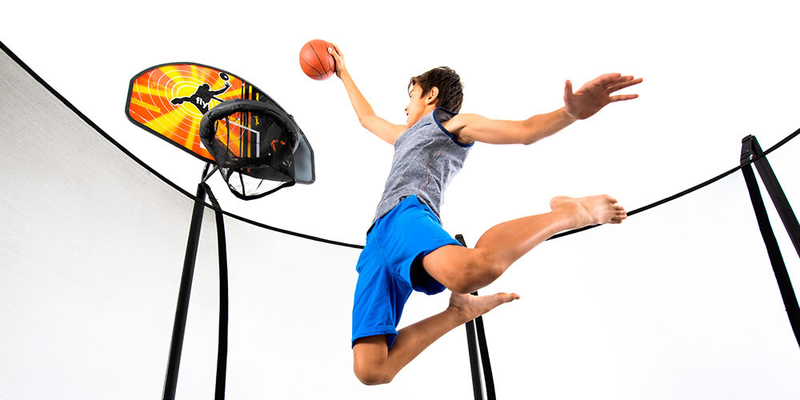 You can start with some practise by installing a Basketball Set on your trampoline or a hoop in the backyard and getting them some confidence prior to the season starting, or get a full hoop for them to shoot on after school. We want every child to find a sport that they love to and give them some physical exercise every day, and for your kids, that sport might just be basketball!